Over 400 people attended "Vectors of Violence" in its first year. Sometimes the most uncomfortable conversations are also the most important ones. It is for this very reason that UNO’s Sam and Frances Fried Holocaust and Genocide Academy hopes to help facilitate these kinds of discussions. 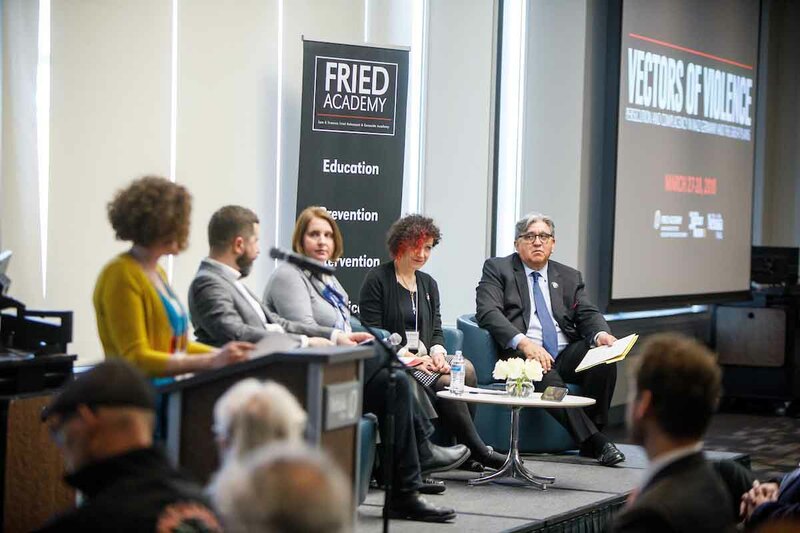 The Fried Academy was established by the Sam and Frances Fried Holocaust and Genocide Education Fund, which has also supported a Holocaust and Genocide Studies minor at UNO. Omahan Sam Fried, a Holocaust survivor, created the fund in hopes of making Omaha a hub for genocide and Holocaust studies. Mark Celinscak, executive director of the Fried Academy, said furthering genocide education in the Midwest continues to be their primary focus. The Fried Academy’s reach goes far beyond the Holocaust, however. “We’re really trying to bring in a lot of various studies that deal with violence, hate, bigotry and bringing it into the context of genocide studies,” Celinscak said. Native American Studies, Black Studies, History, Political Science, Journalism and Women Studies will all be included in the Fried Academy’s future programming. Celinscak says that whether or not people want to admit it, genocide is still occurring in the world today. Another goal of the Fried Academy is to provide unique educational opportunities for students at UNO. One such opportunity just wrapped up, and it couldn’t have happened if not for a partnership with the United States Holocaust Memorial Museum. On Tuesday, March 27, and Wednesday, March 28, representatives and scholars from the museum, as well as higher education institutions across the region, came to Omaha for “Vectors of Violence: Persecution and Complacency in Nazi Germany and the Great Plains,” which drew over 400 attendees in its first year. Kierra Crago-Schneider, program officer in the Jack Joseph and Morton Mandel Center for Advanced Holocaust Studies at the museum, said this was a very unique partnership for the museum. Traditionally, the museum would not target Holocaust or genocide centers because they are already keyed in with many scholars on the subject. They made an exception for UNO, however. “Because Mark was so enthusiastic, and because UNO’s campus seemed to be a great fit for what we are looking for in a partner, we decided to go ahead and try to do it differently,” Crago-Schneider said. Hannah Brandon, a junior history major who is minoring in genocide and Holocaust studies, attended the event. Brandon believes it is very important to have these conversations at UNO. Crago-Schneider and Celinscak hope that UNO and the Holocaust Memorial Museum can continue to collaborate in the future.